This listing is for a SET of refilled PGI-72 cartridges for the Canon Pixma Pro-10 and Pro-10S printers. The refill inks provided in our cartridges are the same high quality set supplied with our Pro-10 (Pro-10S) refill bundles, and bulk ink sets. The provide end-users with a perfect opportunity to test out our inks before purchasing a refill bundle or simply as an alternative to refilling but with the option to send us back your cartridges for re-use and a discount. If you like the results from these inks then contact us for a discount coupon towards a refill bundle and save even more on your PGI-72 inks. The cartridge set will also provide an excellent ready-to-go solution with no old inks to flush or affect colour output. *The PGI-72BK cartridge is provided with our Standard Photo Black ink (as in PGI-72 ink set). Gloss Enhanced Photo Black options are not currently available. These are original/OEM cartridges that have been remanufactured and refilled with the same high quality, compatible pigment inks available in our Pro-10/10S refill bundles. As such they're a great way to sample out ink set before committing to purchase a refill kit or simply as a cost effective way to print on your Canon Pro-10 with a known ink set. 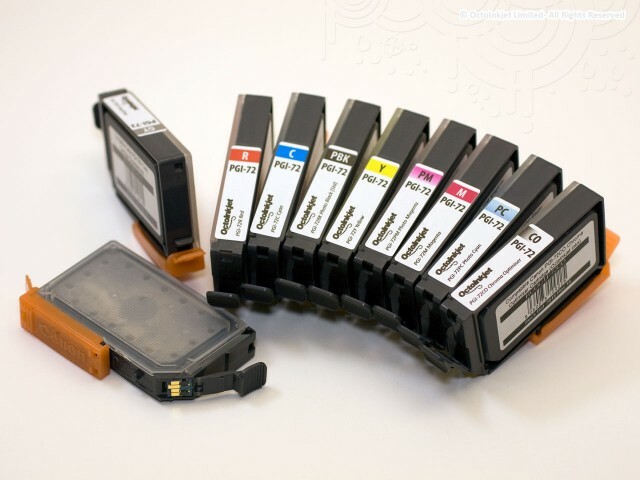 While these cartridges are originally Canon manufactured they have been recycled by OctoInkjet for re-use and are not sold as Canon products.